Cotton appeared before the National Narcotics Officers Association Coalition—an organization that claims to represent 55,000 narcotics enforcement officers across 40 states and Puerto Rico—to receive its "Member of the Senate" Award. Cotton has been a prominent supporter of law enforcement and a critic of sentencing reform efforts, leading efforts in the Senate to defeat or reform the FIRST STEP Act earlier this year. Although he was there to receive an award, Cotton took the time to laud the law enforcement officers assembled, thanking them for the "dangerous, necessary work that you do." "You are the American people's most loyal and underappreciated defenders. You are criminals' toughest foes. And too often, you are drug abusers’ only hope for survival," Cotton said. The NNOAC's officers are collectively major players in what Cotton terms "the greatest drug war in history"—the ongoing struggle to curb the flow of dangerous drugs into American communities. Drug overdoses accounted for over 70,000 deaths in 2017 alone, combining with rising suicide rates to drive down American life expectancy that year—a rare and dire occurrence in the past century. Cotton pointed to the recent seizure of roughly 650 pounds of methamphetamine and fentanyl at the southwestern border, the largest such seizure ever recorded by U.S. Customs and Border Protection. The haul, which was removed form a truck passing through a port of entry in Nogales, Ariz., was estimated to be worth more than 4.5 million dollars in all. "This was not just a drug-smuggling bust," Cotton said of the seizure. "It was law enforcement saving America from a mass-casualty attack. This trafficking was no ‘victimless crime,' the big lie that so much of our culture tells us about drugs. This was law enforcement defusing a dirty bomb at our southern border." Like that truck, many of the drugs that would eventually cause those 70,000 overdose deaths passed through America’s southwestern border. Figures from CBP indicate that seizures of methamphetamine and fentanyl, especially, have increased steadily in recent years. Cotton emphasized in his remarks the way in which this influx of drugs makes the drug crisis an issue of not just demand, but supply. "Pundits and politicians have proposed all kinds of theories to explain this ‘American carnage,' to borrow a phrase. They speculate that the drug epidemic was caused by economic hardship, or loneliness, or despair," Cotton said. "There is probably some truth to these theories, yet they fail to explain the magnitude of the crisis. Something else is at play." Part of the problem has been the push for greater leniency in sentencing of drug offenders, including "activist campaigns to vilify law enforcement and the criminal justice system." "Another cause of this drug crisis, probably the most important cause, is even simpler than wooly-headed thinking about criminal justice," Cotton added. "There is more drug abuse in America today because there are more drugs in America today." Cotton pointed to "Colombian and Mexican cartels"—the latter is responsible for methamphetamine and heroin production, while the former runs most of the cocaine—as major drivers of the overdose crisis. But he also emphasized that "the precursors trace back to China, the real source of our fentanyl problem." "For years, China has flooded our country with poisonous drugs that are killing Americans by the thousands. I’m hardly exaggerating to say that China is waging an opium war in reverse. 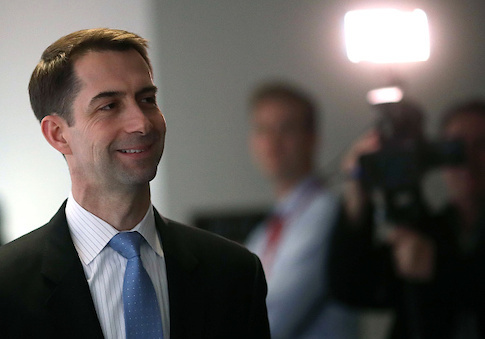 It’s time to put a stop to it, and make China pay," Cotton said. Cotton did not propose concrete steps to take against China's role in the drug crisis (the Trump administration has previously secured a promise from Chinese President Xi Jinping that his government will schedule fentanyl). But he did call for enhanced border security — including a wall—as well as enhanced criminal penalties both for dealers and for "unscrupulous pharmaceutical manufacturers." "For every moment that Washington fails to act, the burden will fall where it always does: On countless American families whose lives are shattered by the drug trade. And on the brave agents and officers who put on bulletproof vests every morning instead of suits and ties," Cotton concluded. "Law enforcement shoulders this burden with heroic resolve, in the face of media scorn and political setbacks. It is your resolve we need most of all to turn the tide in the battle against drugs." This entry was posted in National Security and tagged Border Patrol, China, Drugs, Illegal Immigration, Tom Cotton. Bookmark the permalink.